JASH C.I. Layout and Marking Tables serve as a reference base for inspection, tool making, gauging, spotting marking and layout operations, supported on suitable stands. Stands enable proper leveling of plate and help provide the top surface at a convenient working height of approx. 750 to 800 mm from the floor. 6000 x 2000 mm Maruti Suzuki India Ltd. Gurgaon. 7000 x 2000 mm Toyota do Brazil – Indaiatuba. One set of 12000 x 9000 mm made – up size supplied to M/s. Bharat Heavy Electrical Ltd., Haridwar, comprised of 18 nos. Plates of 3000 x 2000 mm unit size. One set of 12000 x 12000 mm made – up size supplied to M/s. Bharat Heavy Electrical Ltd., Bhopal, comprised of 18 nos. individual Plates of 4000 x 2000 mm unit size. Two sets of 10000 x 12000 mm made – up size supplied to M/s. L&T Mitsubishi Turbo Generators Ltd, Hazira, each comprised of 15 nos. Plates of 4000 x 2000 mm unit size. One set of 8000 x 6000 mm made – up size supplied to M/s. L&T Mitsubishi Turbo Generators Ltd, Hazira, comprised of 6 nos. Surface Plates each of 4000 x 2000 mm unit size. Two sets of 9000 x 4000 mm made – up size supplied to M/s. Bharat Earth Movers Ltd., K.G.F., Karnataka. Each set comprised of 6 nos. Surface Plates each of 3000 x 2000 mm unit size. Two sets of 5000 x 4000 mm made-up size supplied to Heavy Vehicles factory, Avadi, Chennai. Each set comprised of 2 nos. Surface Plates each of 5000 x 2000 mm unit size. One set of 8000 x 2000 mm made-up size comprising of 2 Nos. Surface Plates each of 4000 x 2000 mm unit size supplied to Ordnance Factory Project, Medak., Andhra Pradesh. One set of 6000 x 3000 mm made-up size supplied to Diesel Components Works, Patilala, comprising of 2 Nos. 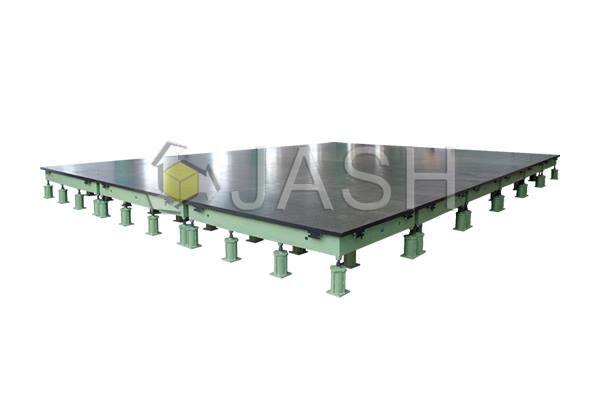 Surface Plates each of 3000 x 3000 mm unit Size. One set of 4000 x 4000 mm made-up size comprising of 2 Nos. Surface Plates each of 4000 x 2000 mm unit size supplied to Polar Satellite Launch Vehicle Project, Vikram Sarabhai Space Centre, Trivandrum. One set of overall size 5000 x 4000 mm made-up size comprising of 2 Nos. Surface Plates each of 5000 x 2000 mm to Volvo India P. Ltd. Banglore. One set of overall size 7000 x 4000 mm made-up size comprising of 2 Nos. Surface Plates each of 7000 x 2000 mm to Toyota do Brazil – Indaiatuba. Made generally as per IS: 2285 from close grained plain cast iron conforming to Grade FG:220 of IS: 210 ( equivalent to GG20/ FT20 / 30-A). Higher grades also offered on request. Column type C. I. Floor stands or M.S. Fabricated stands with leveling screws provided to achieve a desired working height. Special features like grid slots for location, tapped holes and T-slots can be provided on working surface, if required. C.I. Surface tables made from one piece casting, in unit sizes tabulated below, offered in any of the three grades of Flatness accuracies viz. Grades 1, 2 and 3 as per DIN-876 or IS: 2295-1991, as required. Larger sizes are supplied as surface tables with suitable stands. Custom sizes can be made to order. 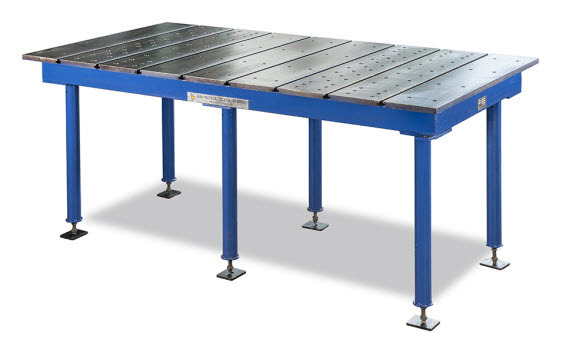 Sectional unit size surface tables adopted for the larger made up sizes are provided with arrangement for interconnection at their joints and column type C.I. Floor stands with leveling screws to facilitate leveling and access from the bottom of the table. 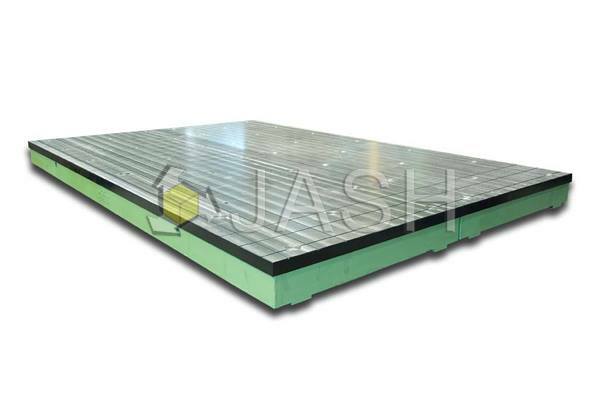 With a view to minimize problems of leveling and mutual alignment while installing as well during future periodical checks, it is advisable to select as large a unit size sectional plate as possible so that the number of joints and the number of floor stands are reduced to the minimum.